Brand: RCM, Rim Country MFG. HK53 8.275" 5.56x45MM cold hammer forged barrel made by RCM. Built to exact German specifications with 1/7 twist, fluted chamber and 15x1 RH threading to accept standard HK33 & G3 muzzle devices. Nitride Finish and Cold Hammer Forged for the ultimate in durability and dependability. Made by RCM, Rim Country MFG. 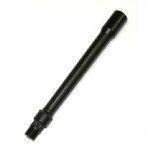 This is the highest quality barrel available for your HK53 build. Counts as one U.S. 922r compliance part.